We’d love your help. Let us know what’s wrong with this preview of Planet Middle School by Nikki Grimes. For twelve years, Joylin Johnson's life has been just fine, thank you very much. A game of basketball with the boys-especially her friend Jake-was all it took to put a smile on her face. Baggy jeans, T-shirt, and hair in a ponytail were easy choices. Then suddenly the world seemed to turn upside down, and everything changed at once. Her best girl friend is now flirting wit For twelve years, Joylin Johnson's life has been just fine, thank you very much. A game of basketball with the boys-especially her friend Jake-was all it took to put a smile on her face. Baggy jeans, T-shirt, and hair in a ponytail were easy choices. Then suddenly the world seemed to turn upside down, and everything changed at once. Her best girl friend is now flirting with her best guy friend. Her clothes seem all wrong. Jake is acting weird, and basketball isn't the same. And worst of all, there is this guy, Santiago, who appears from . . . where? What lengths will Joy go to-and whom will she become-to attract his attention? To ask other readers questions about Planet Middle School, please sign up. For my alternative book report, I have chosen #1 where I tell the president one thing a main character discovered about life and why it is important. I thought this would be perfect for Planet Middle School because the main character, Joylin, experiences transitioning from a child to a woman. It is uncomfortable and awkward for her, but along the way, she learns some important lessons about herself and the people around her. What Joylin had experienced in the novel is the same experience many gi For my alternative book report, I have chosen #1 where I tell the president one thing a main character discovered about life and why it is important. I thought this would be perfect for Planet Middle School because the main character, Joylin, experiences transitioning from a child to a woman. It is uncomfortable and awkward for her, but along the way, she learns some important lessons about herself and the people around her. What Joylin had experienced in the novel is the same experience many girls have going from 5th grade into 6th grade. I believe what Joylin had discovered about life is the most important theme in this novel, so alternative book report #1 was the best choice in my opinion. 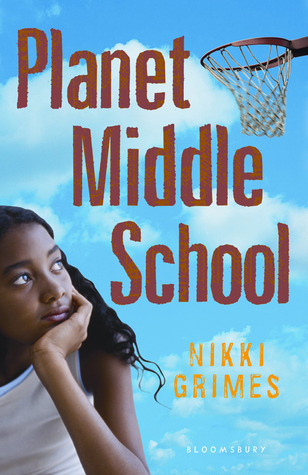 You had contacted me earlier this week upon learning that I have read Planet Middle School by Nikki Grimes. You had asked me what the main character, Joylin, had discovered about life that I think all Americans should know and why. Well, I think Joylin learned many important lessons about friendship and relationships with her family, but there is one main lesson that stuck out the most to me. Joy had been a tom boy and basketball player all of her life. She wore clothes from the boys section because they were loose and easier to play sports in. She never cared about what boys had thought of her before until she met one boy in particular. She wanted his attention badly and part of her was not sure why. He didn’t seem as interested in her though. She noticed he looked at the girls in the hallway that wore tight clothes, wore makeup, and strutted around in heels. To gain his attention, Joy tried wearing skirts, heels, and lipstick, but it all ended up in an embarrassing mess. It turns out in the end, the boy she was after preferred sportier girls over “girly girls”. Joylin was heart broken, but after talking with her best friend, she realized she was changing who she was not because she wanted to, but because someone else wanted her to be that way. While she did want to feel more feminine, she was not comfortable going to extremes. In the end, she decided she wanted to wear more fitting jeans with embellishments and that was enough for her. She should decide who she wants to be, not some boy. Every American should learn this lesson because I think everyone goes through this stage, yet it is one of the hardest things to go through and realize. Pre-teens and teens have such a hard time trying to figure out where they fit in and who they are, that they start becoming who others want them to be. Most people don’t figure out who they truly are until they are in their 20s. If all Americans learned this lesson early on, people would not waste their time worrying about what others want them to be and follow their own desires. This applies with friendships and relationships as well. Too many times I have seen girls change who they were to gain the attention of a boy. If someone is not into the way you are, then it will never work out, even if you try changing. It is best to find someone who loves and accepts who you are and what you want to be. This book was just okay. It didn't make me jump out of my seat but I didn't want to throw it out the window, I just read the book then moved on. This book is about a middle school girl named Joy who is great at basketball and has two best friends named Jake and Keelee. Joy is kind of a tomboy, she wears baggy jeans and tee shirts all the time and is always playing basketball with the boys. That starts to change though when she meets a new boy playing basketball one day named Santiago. Joy starts This book was just okay. It didn't make me jump out of my seat but I didn't want to throw it out the window, I just read the book then moved on. This book is about a middle school girl named Joy who is great at basketball and has two best friends named Jake and Keelee. Joy is kind of a tomboy, she wears baggy jeans and tee shirts all the time and is always playing basketball with the boys. That starts to change though when she meets a new boy playing basketball one day named Santiago. Joy starts feeling herself change after she starts liking Santiago more and more. She wants him to notice her so she starts dressing and acting like all the other girls at school. She gets to the point that she's wearing makeup, skirts, heels, swaying her hips when she walks, and losing both of her best friends. Then one day Jake gets in a accident and Joy starts to realize who she has really become. Read the book to find out what Joy does next. Who will she get, her best friends or her crush? Planet Middle School is the story of Joylin, an intrepid sports playing, jean wearing tomboy, told in a series of poems. The poems tell of her relationship with her family, friends and dealing with all the changes that happen to a young girl as she journeys from child to young woman. Joylin’s best friends are Jake and KeeLee, who love her for who she is. Joylin begins to have uncomfortable and surprising feelings for a boy at school, Santiago and she tries to transform herself into a girly-girl with disastrous results. It is all just so embarrassing! Jake is injured in a car accident and Joylin is terrified because the last time they spoke they fought bitterly. As she waits in the hospital, begging Jake to open his eyes, she realizes that Jake is right, she should just be herself. In the end, Joylin learns that the only way she can be happy is to do what she loves and be with the people who make her happy, her friends and family. This book is very accessible and easy to read. The prose poetry flows nicely and the story is told in a fairly straight forward manner. I would recommend this to a teen girl who is at that awkward place of trying to figure out who they are and how they can be comfortable in their own skin. This was a very quick read for me. It's about a girl who is a complete tomboy and then all of sudden is worried about appearance and all that jazz. The book is written in verse which I do like that style of writing because you have to use some brainpower to figure what is going on in the book. Decent book overall, but there are many better out there. I've literally lost count of how many times I've read this book and I think it deserves a place in my favorites shelf. One Sentence Review: Middle school books about African-American girls are hardly common so definitely consider this one, even if it's not quite Grimes' best work. I'm actually giving this novel in verse 3 1/2 stars. It's a pleasant story about a middle school tomboy who loves basketball and whose changing body causes her to start noticing boys. Should she dress like the rest of the girls, or should she be herself? Middle school readers will relate to this. Recommended. I thought this was an extremely funny book, because I felt like I was back in middle school. The main character was shocked when her best girlfriend started to flirt with her best guy friend. I would highly recommend this book to anyone who wants a good laugh. Short verse novel about tom boy Joylin as she discovers new aspects about herself. Nice family dynamics, and a clear message about being yourself. Planet Middle School is the story of Joylin, an intrepid sports playing, jean wearing tomboy, told in a series of poems. The poems tell of her relationship with her family, friends and dealing with all the changes that happen to a young girl as she journeys from child to young woman. Joylin’s best friends are Jake and KeeLee, who love her for who she is. Joylin begins to have uncomfortable and surprising feelings for a boy at school. Planet middle school was a great book. The characters just popped out of the book I felt like. In this book you can relate to this person and how the characters feel. This girl in middle school loved basketball but she started to grow up and she didn't like that she made herself invisible. MShe tried This book reminded me of this Video I saw on face book about bullying and she never stood up for herself but finally her brother said to the people who we're bullying the girl to stop. I thought of that because you shouldn't be rude to anyone or offend them in any way. I recommend this book to you because it will change Your life and almost everyone can relate to this when they were in middle school. I am in middle school and I'm 12 so this book really helped relate to others and myself. You should also read this because you can try to help others through they're problems. A delightfully easy read, exploring the challenges of puberty from the perspective of Joylin Johnson. Grimes employs free-verse poetry to tell Joylin's story, which makes this a fast and fun read. I really enjoy the ways that gender and gender roles are explored, with Joylin a "tomboy" who loves basketball, and her brother who loves drawing. I would have liked Grimes to explore their father's feelings around this topic more (its resolved relatively simplistically) and provided more depth to his A delightfully easy read, exploring the challenges of puberty from the perspective of Joylin Johnson. Grimes employs free-verse poetry to tell Joylin's story, which makes this a fast and fun read. I really enjoy the ways that gender and gender roles are explored, with Joylin a "tomboy" who loves basketball, and her brother who loves drawing. I would have liked Grimes to explore their father's feelings around this topic more (its resolved relatively simplistically) and provided more depth to his initial disinterest in his son's art vs his embrace of Joylin's basketball skills. This book was really interesting because it ibcluded the idea of growing up and how it affects not only you but the ones near you. I was able to have a good laugh and also reflect on the idea of acceptance and how at times we are like jake and try to please others before ourselves in order to be accepted and meet their expectations. Its often hard to be the one seeing that happen and how they get carried along into doing things that are not what one is. Planet Middle School was a beautifully written and relatable text. The entire text is written in prose and focuses on the life on Joylin “Joy” Johnson. Up until this point in her life, Joy’s life had been static. She’s what some refer to as a “tom-boy,” dressing in jeans and t-shirts, who’s main hobby and happiness in life stemming from basketball. But as her body, as Joy seems to believe, “betrays her” by changing, so is her personality. Joy’s crush on a boy pushes her to start changing who she Planet Middle School was a beautifully written and relatable text. The entire text is written in prose and focuses on the life on Joylin “Joy” Johnson. Up until this point in her life, Joy’s life had been static. She’s what some refer to as a “tom-boy,” dressing in jeans and t-shirts, who’s main hobby and happiness in life stemming from basketball. But as her body, as Joy seems to believe, “betrays her” by changing, so is her personality. Joy’s crush on a boy pushes her to start changing who she is, and to be somebody else, in order to be what she thinks other wants. Because of this, Joy begins to clash with her friends and family, who try to tell her that she doesn’t need to change who she is or be someone else to get other people to like her. Of course, Joy doesn’t listen but needs to come to this conclusion herself. The novel deals with various internal and external conflicts of the middle school reader. Joy smashes heads with her childhood best friend, and with her father over his constant dismissal of her younger brother’s artistic abilities. This novel perfectly characterizes and approaches many issues that middle schoolers face. It’s perfect for helping middle school readers to both understand what they’re going through, and to provide them reassurance that everything will turn out all right. Planet Middle School, by Nikki Grimes, is a novel in verse book. This book is about a teenage girl named Joylin, who is growing up. The setting is mainly her house, and a basketball court. Joylin plays basketball with all of the boys, some people even considered her a boy. She has never been interested in makeup or dating, or any girl stuff. Until now. Joylin starts to notice change. She develops a crush, and asks her friend KeeLee for help impressing him. She wants to be back to normal, but her Planet Middle School, by Nikki Grimes, is a novel in verse book. This book is about a teenage girl named Joylin, who is growing up. The setting is mainly her house, and a basketball court. Joylin plays basketball with all of the boys, some people even considered her a boy. She has never been interested in makeup or dating, or any girl stuff. Until now. Joylin starts to notice change. She develops a crush, and asks her friend KeeLee for help impressing him. She wants to be back to normal, but her life has forever changed. At home her dad shows her too much praise and her brother none at all. Joylin has to figure out her own problems, and help her brother figure out his too. I like that this book is very relatable to teenage girls that have noticed change. I also found the transition from normal to different very spaced out, and not all of the sudden. I feel like Joylin had too many problems in her life all at once, which can get a bit overwhelming to some readers. It was hard to keep up with her relationship with the other characters in the book. I recommend this book to teenage girls who are just experiencing change and trying to deal with it. I think this a good book for every girl to read because it takes real life struggles and makes them into an understandable story. This verse novel relates the story of a girl in middle school named Joylin. She never used to care about boys or her appearance, but things are changing. Joylin loves to play basketball and wear comfortable baggy clothes. When she starts to notice a certain boy, however, she tries to change her appearance in order to get his attention. Along the way she realizes that by becoming someone she's not, she's losing sight of the things that matter most in her life. She learns to stop trying to impress This verse novel relates the story of a girl in middle school named Joylin. She never used to care about boys or her appearance, but things are changing. Joylin loves to play basketball and wear comfortable baggy clothes. When she starts to notice a certain boy, however, she tries to change her appearance in order to get his attention. Along the way she realizes that by becoming someone she's not, she's losing sight of the things that matter most in her life. She learns to stop trying to impress other people and just be herself. Planet Middle School perfectly captures the common feelings and experiences of girls going through puberty. It's relatable, funny, charming, and heartfelt. This story relates the feeling that most kids at this age have - that middle school is like another planet. Everything is changing, which is weird and scary. could I ask for, right? Grimes’s simple, elegant free verse deals deftly with changes: changing bodies, changing friendships and changing feelings. A great class text and a lovely, warm, immediate read for kids entering adolescence. Planet Middle School is a good read. It's about a tomboy named Joylin Johnson, who loves basketball and is noticing her bodily changes. She even starts to develop a crush. She changes her appearance to be more girly to try to grab her crush's attention. Joylin then figures out that she should not be acting like other people and to just be herself. This poetry-written book is a great read, and I would recommend it to middle school girls. It talks about the struggles a middle school girl goes throug Planet Middle School is a good read. Joylin, a basketball player, is navigating the world of middle school for the first time. She has her friends to help her. There's KeeLee, a preacher's kid, who was "The only familiar thing about this school year." And her friend, Jake, who is always up for a game of one on one. They have been friends so long that "silences between us are filled with friendship." But does Jake have feelings for KeeLee? How will that impact his friendship with Joy? And what happens when Joy notices Santiago for t Joylin, a basketball player, is navigating the world of middle school for the first time. She has her friends to help her. There's KeeLee, a preacher's kid, who was "The only familiar thing about this school year." And her friend, Jake, who is always up for a game of one on one. They have been friends so long that "silences between us are filled with friendship." But does Jake have feelings for KeeLee? How will that impact his friendship with Joy? And what happens when Joy notices Santiago for the first time? Will she have to change who she is to get his attention? At home, Caden, Joy's little brother, is going through a rough time, as well. He is an artist, rather than an athlete. Something that his father doesn't seem to understand. "Too bad you can't go out for a sport like your sister, instead of doodling." But Joy encourages Caden's art (Watch my words paint a smile on his face) and tries to help her father see that Caden doesn't have to be an athlete to be successful. Told in verse format, this is a beautifully poetic story. First crushes, trying to figure out who you want to be, and changing bodies and moods all contribute to the feeling of confusion to which readers will relate. Sometimes funny and often poignant, it's a great coming of age story. "Period. That's a good name for it. It's the end of my life as I know it." This review has been hidden because it contains spoilers. To view it, click here. This was a pleasant and short read. Joylin’s struggles are relatable as she tries to remain who she is as she begins to grow up. Her brother’s journey through the book is similarly meaningful although she does not make this connection despite helping him. A fun journey told through poetry about being true to who you are. I liked how I could naturally flow on with the scenes.The poems were great and I loved how they described her everyday life.I was scared to start middle school and I read this book and wasn’t scared anymore.Every time I read it again,it’s so relatable.This book is great for young adults and upcoming 6th graders. Joy is a girl going through puberty. Her best friend is a boy and sexual feelings interrupt their feelings of comfort with dad other. How is Joy of Joylin going to handle this? The book is written in free prose and each page contains few words. This is great for low readers looking for high interest reading. Very nice. The complexity that was conveyed in the short poetic vignettes (chapters) made this book amazing to read. I am an aspiring middle grade author and I learned so much about how to connect to kids this age, what's important to them and how to not over complicate things. Excellent writing, lyrical with a rhythm that made it a fast read while pulling at the heart strings. Beautiful Book! This book wasnt very good. It had maybe 15-20 words on each page and just wasnt interesting. If you like smaller books you should get this book. When i got this i only looked at the first few pages of the book and they were longer. But overall this book was short and not interesting. Nikki Grimes always finds a youthful voice and gets to the heart of young audiences. Basketball playing tomboy, Joylin has always been comfortable in her skin and who she is...but hormones shake that all up...you feel the awkwardness of those years again in this book-in-verse reality check. I didn't like this book. It was really boring, and the story wasn't interesting. I don't care about what happens in middle school. I don't like how she changes herself to impress a guy. Three stars max. Grimes has done an awesome job with the character, Joylin as she faces the changes in her body and her heart during middle school.